How Do I Protect My Great Sticker Idea? We hear this question a lot and although we focus on production and not distribution we can perhaps help point you in the right direction and share our opinions. Your original graphics and phrases are covered by a copyright the moment they are written or created. You can use the “C” symbol without registering the work. Officially registering with the Library of Congress costs about $30 and is necessary if you were ever going to need to take legal action. In most cases with stickers, legal action would never be worthwhile. We suggest adding the “C” symbol on original material (it’s free) to discourage copying. We also recommend you do thorough internet searches yourself to determine how original and strong your idea is and that you are not infringing on someone else. As with any product idea, it is very difficult to sell sticker ideas. You could target a specific company with what you believe would be a profitable product (sticker) but these companies usually have plenty of their own ideas. It makes more sense to initially create them and sell them your self. If it is properly protected and a huge hit you could then look, perhaps, towards distribution partnerships, licensing, etc. But these arrangements are not very common. 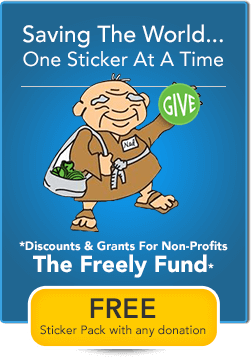 Many of our clients sell or distribute their stickers online. Selling directly to the public is always the most profitable. But, if you want to sell off-line through retailers there are a few options. You can drive around pushing your wares to whoever will listen or you can find a sales rep to do it for you. We recommend finding a sales rep already selling to the stores you want to target with your product(s). They cover much more ground then you could on our own and are connected with other rep networks to cover even more ground. Sales Reps usually get a percentage of the sales they make. 15% is what one of our clients pays. Reps also will probably not be interested in one product. They want to represent a full line of desirable stickers and perhaps have display options – whatever helps promote and sell the products. As a general rule, retailers like having a 100% mark up. If it sells to the end customer for $2, sell it to the store for $1. 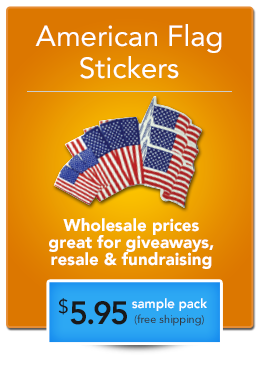 If stickers sell for $1 sell them to the store for 50¢. It is also desirable to sell them in quantity. You don’t want to deal with selling 10 stickers at a time (unless you are selling direct). Sell them to resellers/retailers in batches, perhaps 50, 100, 150, 200 with larger quantities having a better price. Encourage stores to buy more and make it worth their while. You don’t want to deal with consignment – it’s a nightmare to keep track of. If anything, offer to buy back unsold merchandise after a certain amount of time has passed. But again, why encourage people buying larger quantities if you are going to buy it back (perhaps damaged). They then have paid less for the product. Currently, there is no shortage of people with ideas. But, there will always be a shortage of people who care. Everyone thinks they have great ideas – I’ve had at least 3 great ones today. Executing the idea… distributing the idea… profiting from the idea – that is the tricky part. If you’ve got a great idea for a sticker product Websticker.com would love to help flesh it out into the best copy, design and product it can be. But we can’t help sell or distribute that product for you. Spreading the idea (product) is your job. Don’t worry about sharing ideas or protecting them. Share the idea, flush it out, and if it seems to resonate with people, get help making it the best it can be. I recommend you read Seth’s whole post, How To Protect Your Ideas In The Digital Age as it has some good information to think about regarding trademarks and copyrights. So, share your ideas freely, get feedback, do your homework on similar ideas or products, and if you decide to start a small business based on your idea be prepared to do the work. Nice post. I like the reference to Seth Godin. You should go check out his TED talk if you haven't seen it.